The historic town of Saint-Émilion, east of Bordeaux, is famous for its wine and macaroons, but it's also a fine place to visit for its history: it's a UNESCO World Heritage Site with interesting things to see and do. Set on a hill surrounded by vineyards and wine châteaux, Saint-Émilion is far more than meets the eye. 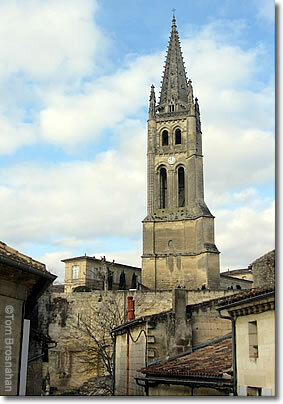 The town takes its name from a saintly hermit named Émilion who lived in a cave carved from the limestone of the hill. Over the centuries much more limestone has been quarried beneath the town, so that the hill is pierced by caves and tunnels, one of which has been fashioned into a huge troglodytic church. Today many of these caves and tunnels are used for the storage of wine. Added to the favorable climate, the mineral-rich soil, and the wine-makine expertise of the local vintners developed through many centuries, this long, careful storage in the caves is the secret of high-quality Saint-Émiliom wines. Wineshops all over town provide tastings and sales by the bottle or case. The Maison du Vin is admirably stocked and organized, with advantageous prices clearly marked. There are numerous good local resaurants featuring—of course—the local wines. The Bell Tower, tallest steeple in town.